View Poll Results: Do Roger Maris or Albert Belle belong in the HOF? Take a look at 1961 - the league avg. BA was .258 - that doesn't seem so high as to call the pitching watered down. Lots of years the BA has been higher. Maris won 2 MVP awards. Are there any other multiple MVP award winners not in HOF ? Based on his peak years I might put Schilling ahead of Mussina. Emphatic +1. Schilling, more than any other player (including Pedro, Manny and Papi), turned the Red Sox from a loser franchise to a winner. I am still baffled by your characterization here. Maris won the MVP in 1960. Norm cash finished FOURTH in voting in 1961, behind Jim Gentile. Jim Gentile did have one heck of a 1961 season...46 home runs, 141 rbi, .302 batting average, .646 slugging percentage. Watered down pitching allowed Maris to have a career year, Cash to have a career year and Gentile to have a career year. Yet Maris is the only one being talked about as being a Hall Of Famer. If you are going to give credit for Maris having a big year when the pitching was watered down then you also have to give credit to the other guys and if you do that then Maris had a worse year than the other two except for the home run total. "Hey, Norm...[chew...chew]...how much you wanna bet that in 2019 people are going to have a very contentious argument about you and me?" Maris would never win the MVP today. Mark Mcgwire didn't win MVP when he hit 70 Hrs. It is also why players aren't elected to the HoF because they broke one record or had one good season. Mantle should have won MVP, he led the AL in WAR with 10.5. Cash was 2nd with 9.2. Maris was tied for 5th with 6.9. Maris may have hit 61 Hrs, but he was certainly greatly helped by having the true AL MVP protecting him in the lineup. Maris was never intentionally walked in 1961. Most likely never pitched around and saw good pitches when pitchers fell behind in the count. Still overall he didn't have that great of a season. When Ryan Howard hit 58 Hrs in 2006, we had 37 IBB and a total of 108 BB. How many more Hrs does he hit if he is protected in the lineup by Mickey Mantle? Today we have the ability to look deeper than how many Hrs a player hit or that writers voted for a guy who they really shouldn't have for an award. Not that great of a year? He led the entire league in runs, home runs, rbi's and total bases while breaking a record held by Babe Ruth. McGwire didn't win when he hit 70 but Sosa did for hitting 66; not really an apt comparison when both players broke the record and one of them still won MVP. Bonds also won MVP when he broke McGwire's record. Lastly, I think you're wrong about players not getting in for a historic season. Bill Terry was a great hitter, but he waited 15 years for induction and it took him 9 years to even get 50%. Are you suggesting his ultimate induction had nothing to do with him hitting 400? Last edited by packs; 03-14-2019 at 08:20 AM. His .400 season had something to do with it but Terry was a lifetime .341 hitter so his great season wasn't the only reason. Maris' supporters want him in the HOF based on 1 great season. Right, but at the time he got in, there were no advanced stats so the focus probably was more on his BA. Sisler is another guy whose advanced stats really lag behind his BA and perhaps public perception. Last edited by Peter_Spaeth; 03-14-2019 at 08:46 AM. Right, but at the time he got in, there were no advanced stats so the focus probably was more on his BA. Which one, though? Lifetime or the year he hit 400? I suspect some of each, but that without the career the one season would not have been sufficient. Everyone with 5000+ ABs and a .340+ BA is in the Hall. Doesn't matter what their best season was. edited to add: The best career batting average of players with 5000 or more at-bats who haven't been inducted is .324 (Babe Herman), followed by Helton and Cabrera at .316. Last edited by darwinbulldog; 03-14-2019 at 09:30 AM. Do you think if Babe Herman hit 7 points higher in 1930 and finished with a 400 average as opposed to 393 he would be in the HOF? But still ending up with a .324 career average? Good question. I guess I'd put it around a 50-60% chance, but I would contrast that with the probability that Terry would have gotten in had his .400 season been a .393 instead and his career average still been .341. I'd still put his odds at better than 95%. 1930 was the year that the entire NL batted over .300 with an ERA of 4.97. Terry was a rung or two above Herman for the year and for their careers, but the hitting in 1930 makes Lefty Grove’s pitching seem surreal. Terry and Herman not so much. AL batting numbers in 1930 were a bit less than the NL, but Grove was a good part of the reason for the difference. Wouldn't it be 107 for and 156 against? The for only Joey would be a vote against Roger. Then Roger gets the both votes. Those old cigarette ads are cool. Last edited by bnorth; 03-14-2019 at 10:26 AM. He was also a dead ringer for Baron von Richthofen. That should count for something. Richthofen is definitely Hall of Fame material! That goes without saying. I am still trying to pick my jaw up from the floor with the Harold Baines induction. Hall of Fame - says so right there in black and white...FAME. 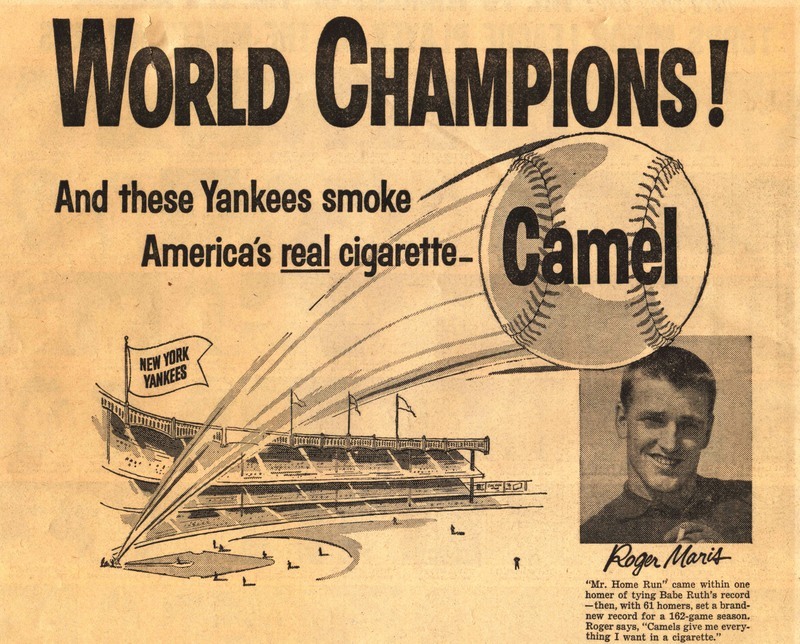 Not one person alive can rightfully argue Roger Maris was not famous. Yeah he went 80 for 81. Maybe in the New York area. The 1961 season was 58 years ago. Unless someone is ~65 they weren't old enough to remember to chase. Most people in the West, South or Midwest have no idea who he is. The argument is whether or not he WAS EVER famous.... not whether or not he is famous now. By that logic, how many people or even casual baseball fans today could tell you who Mathewson or Ward or Anson are? Probably close to zero... so does that mean they were never famous? Of course not. And people in the West, South or Midwest certainly knew who Maris was in 1961... unless they lived under a rock. You can also add that most players with little fame do not have movies made after them. It's not in the top 500 seasons for position players WAR. You want to put a guy in the HOF based on 1 season then why not Al Rosen for 10.1 WAR in 1953? Or how about Dwight Gooden for 12.2 WAR in 1985? Rico Petrocelli 1969 was right up there with Rosen. We are not talking about just any old puny record here like most bunt singles in a season, or most steals of 3rd, or some other such record. We are talking about one of the most haloed, prestigious and most famous records in all of American sports history - most HR in a season ! Also, by the way he had not one but 2 MVP winning seasons, and several all-star games to boot. Down play it all you want, everyone it entitled to their opinions. DiMaggio's 1941 season is good for only 123rd all time in terms of single season WAR. Does that make his 56 game streak null and void? It's still considered one of the greatest seasons anyone has ever had. Last edited by packs; 03-14-2019 at 06:11 PM. Denny McLain, anyone? Back to back Cys and an astonishing 30 win season. Last edited by Peter_Spaeth; 03-14-2019 at 01:19 PM. Hitting 61 Home runs or more? Now how many players are in THAT list? His 31 win-season is especially impressive... I'll give you that. I don't think anyone identified McLain as a guy who fell off the cliff in the other thread, but he would be a very good example. Agreed. Maris deserves to be in the HOF. Joe DiMaggio's 56-game hitting streak will never be broken with the current breed of BB players. All other BB records may be broken....BUT, not this one (in my opinion). Furthermore, it dramatically shows that this term called "WAR" is just a bunch of newspeak "hor$e-cr@p" as a meaningful metric to judge a BB players value to his team. Right-on, packs....thanks for posting this bit of trivia. While I agree Ted that the Clipper's record will probably never be broken... Its possible. What's impossible, is someone climbing past Young's 511 wins... that record is sealed for the ages. Joe DiMaggio's 56-game streak is possibe. But, highly improbable. DiMaggio's hitting style has become a lost art. How many of you realize that DiMaggio ran a 66-game hitting streak in the PCL ? So, Joe had "been there, done that". A pitcher with peak ability somewhat better than, say, Pedro Martinez also has, via good genes and mechanics and improvements in athletic training, the longevity of Nolan Ryan and is fortunate enough to pitch for a team that, on average across his career, also has the best lineup in his league. Let's say also that his career starts ten years from now when every team has a 2-3 inning starter and a 1 inning closer, and that this guy's job is to pitch innings 3-8 every fifth day or 4-8 every fourth day. He pitches for 25 years and also happens to be a slightly more skilled pitcher than the best ones we've seen so far. Such a pitcher would average better than 20 wins a year (i.e., > 500 career Ws). The odds that someone will break Hoss Radbourn's single season mark are much lower, and as I've mentioned before, anyone who can somehow win 61 games in a year at some future date stands an excellent chance of winning at least 512 in his career, whereas even a pitcher who somehow ends up with 512 career wins is unlikely to have had any 50 (let alone 60) win seasons. He literally struck out less in a season a couple of times than some guys now strike out in a week. His record, at least in present times, is safe. Yeah I saw that it's hard to believe there are 122 better seasons out there than DiMaggio 1941 I don't know WAR well enough to know where the disconnect is there. On a interesting note Carl Yastrzemski had the 3rd best single season WAR in 1967. I am not sure with even using the terms theoretical and hypothetical that season can be the 3rd best ever. Last edited by bnorth; 03-15-2019 at 04:20 PM. To break Ryan's 7 no-hitters, Wow ! Now we are talking some amazing incredible other-worldly pitcher. Probably have to do a DNA test just to make sure he is from Planet Earth. Hitting streaks don't add value apart from the hits themselves though, and it doesn't even rank in the top 500 seasons in terms of his hit total. George Box is noted for his invention of the Box Score as well. As well as his lunches, socials, and jellyfish. Damn it, just picked up my first pack of camels in over 15 years... was only a matter of time. Totally blaming it on the catchy advertising. Who said anything about the streak? Last edited by Peter_Spaeth; 03-15-2019 at 08:28 PM. Can't believe I'm dignifying this with a response, but here I am, so congratulations. 1) At least five of us just in this thread, including yourself. 2) It is literally, as I suspect you already know, the reason DiMaggio's 1941 season (as opposed to any of the hundreds of other 30+ HR/125+ RBI seasons) is being discussed here. 3) Zero, yes zero, of the very statistics you just cited above rank in the top 100. Most aren't even close. For that matter, none of them even ranks as DiMaggio's personal best. Last edited by darwinbulldog; 03-16-2019 at 05:16 AM. Reason: corrected "125 RBI" to "125+ RBI"
Not any more. It's only the 7th highest total. It's not like there was a lot of interest when Stanton hit 59 in 2017 or Ryan Howard hit 58 in 2006. If Maris couldn't get elected 25 years ago, there is zero chance he gets in in the future.